The great white shark (Carcharodon carcharias), is one of the most feared sharks in the world. The great white belongs to one of the oldest groups of sharks: the mackerel sharks. 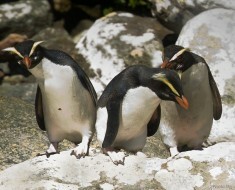 Many of its members have existed, in close to their current form, for over 120 million years. Great white sharks live in almost all coastal and offshore waters which have water temperature between 12 and 24 °C (54 and 75 °F), with greater concentrations in the United States (Northeast and California), South Africa, Japan, Oceania, Chile, and the Mediterranean. The lifespan of great white sharks is estimated to be as long as 70 years or more. Great white sharks may not be the world’s biggest sharks, since that title goes to the whale shark, but they are the planet’s largest known predatory fish. Great white sharks are from 3.4 to 6.1 meters (11 to 20 feet) in length and weight between 520 and 2,268 kilograms (1,145 and 5,000 pounds). The female is usually larger than the male. Its shape resembles a torpedo with a pointed tip, making this predator extremely fast in the water and amazingly efficient. Great white sharks can accelerate to over 56 km/h (35 mph) for short bursts and can at times launch themselves more than 3 meters (10 feet) into the air. 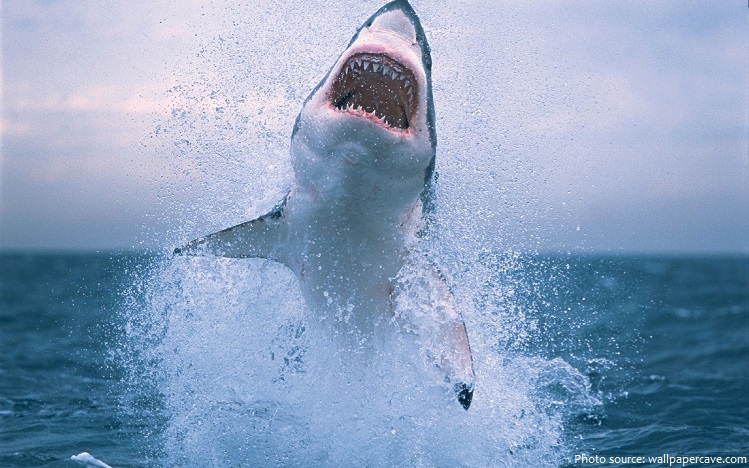 In addition to its ability to swim in short bursts, a great white can also move at a steady cruising speed. Scientists recorded one great white that swam a total of 19,955 kilometers (12,400 miles) in nine months, an average of 72 kilometers (45 miles) each day. The great white is an epipelagic fish. This means that it inhabit the epipelagic zone: from the surface of the sea down to 200 meters (650 feet). But in the open ocean, it has been recorded at depths as great as 1,200 meters (3,900 feet). Great whites migrate long distances. Some make journeys from the Hawaiian Islands to California, and one shark that swam from from South Africa to Australia made the longest recorded migration of any fish. 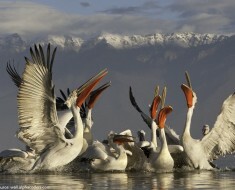 The reasons for their migration and what they do at their destination is still unknown. 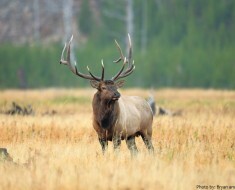 Possibilities include seasonal feeding or mating. 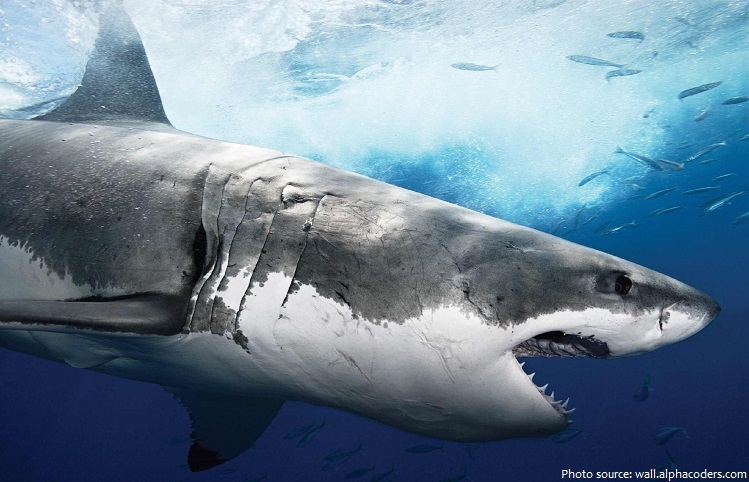 The structure and behavior of the great white shark is still a big mystery. The great white shark is mostly a solitary creature although it can reunite with others of its same species. 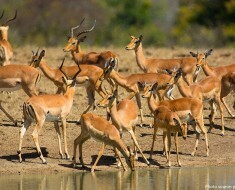 When they do meet or swim in groups, they typically avoid conflict and dominance battles. 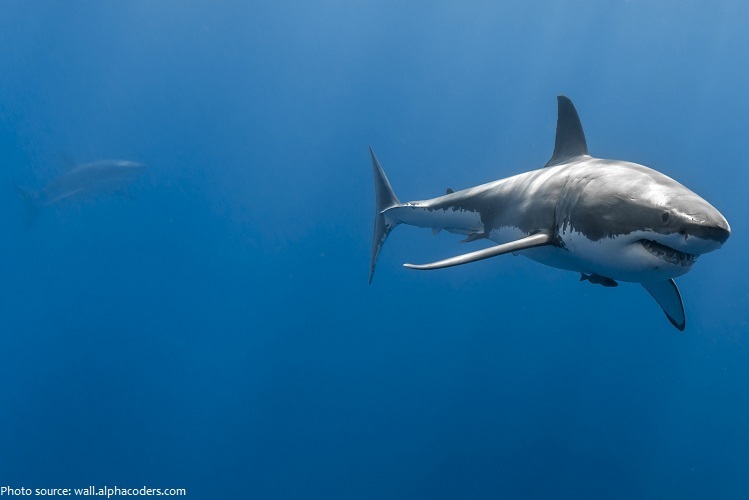 However, there are places, such as the waters around Africa, where great white sharks show a distinct hierarchy: females dominate males, larger sharks dominate smaller sharks, and residents dominate newcomers. In contrast to most fish, which tend to be cold-blooded, the great white shark is warm-blooded, so it can regulate its own body temperature, thus allowing it to adapt to different water temperatures. They have five gill slits and eyes that do not have a protective membrane. However, these sharks can actually roll their eyes back, thus preventing the most vital parts of the eye from being scratched. 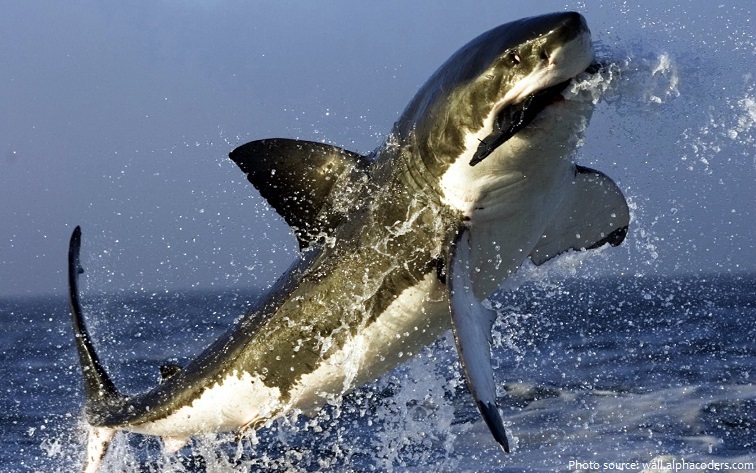 The great white shark has a tremendous brain that coordinates all the highly-developed senses of this efficient hunter. Their sense of smell is so unbelievably acute, that they have the ability to smell a single drop of blood in 100 liters (25 gallons) of water and can sense even tiny amounts of blood in the water up to 5 kilometers (3 miles) away. They even have organs that can sense the tiny electromagnetic fields generated by animals. 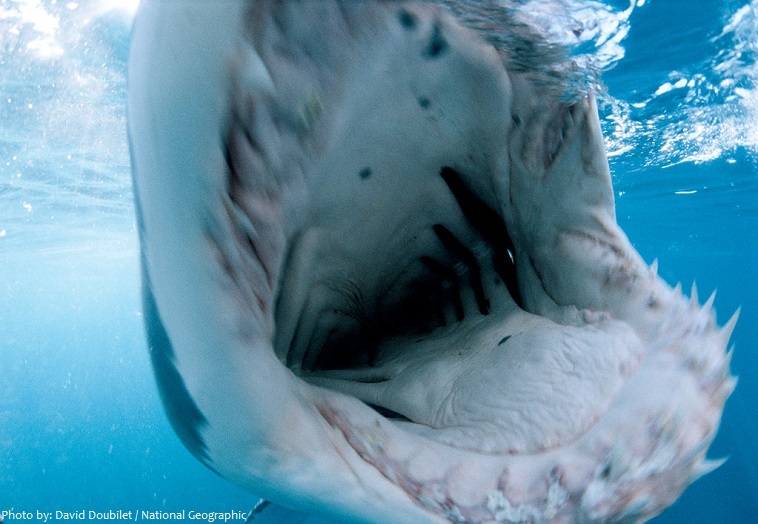 The great white shark mouth is equipped with a set of 300 sharp, triangular teeth arranged in up to seven rows. 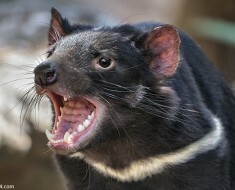 Their teeth rip prey into mouth-sized pieces which are swallowed whole. Intelligent and efficient, they hunt with speed, force, and deadly precision. their meal in their mouths. Great white sharks are carnivores. They generally eat larger prey, such as pinnipeds, which include sea lions and seals. 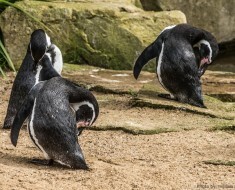 They also eat nearly anything they can get their teeth into, such as small whales like Beluga whales, dolphins, other sharks, sea otters, sea turtles and even seabirds. The great white tends to hunt live prey, but it eats dead animals floating in the water as well when the opportunity presents itself. A big meal can satisfy a great white for up to 2 months. Little is known about the great white shark’s mating habits. Great white sharks are ovoviviparous, which means eggs develop and hatch in the uterus and continue to develop until birth. The great white has an 11-month gestation period. When a great white shark is born, along with up to a dozen siblings, it immediately swims away from its mother. Baby sharks are on their own right from the start, and their mother may see them only as prey. At birth the baby shark is 1.2 to 1.5 meters (4 to 5 feet) long already. As large and powerful predators, great white sharks play an important role at the top of the marine food chain. 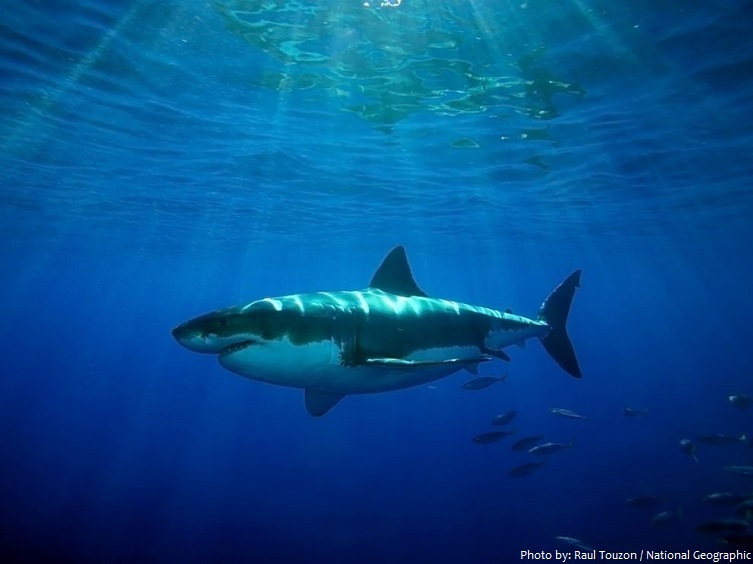 The great white shark has no known natural predators other than the killer whale. The IUCN notes that very little is known about the actual status of the great white shark, but as it appears uncommon compared to other widely distributed species, it is considered vulnerable. More than any documented bite incident, Peter Benchley’s best-selling novel Jaws and the subsequent 1975 film adaptation directed by Steven Spielberg provided the great white shark with the image of being a “man eater” in the public mind. 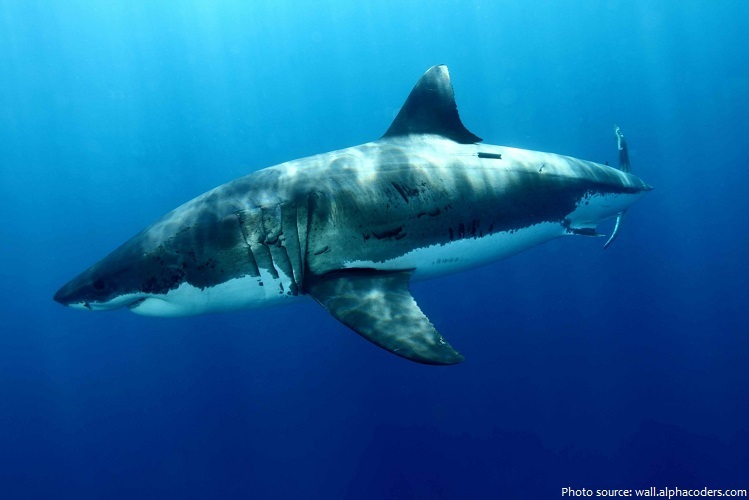 Humans are not the preferred prey of the great white shark, but, nevertheless, the great white is responsible for the largest number of reported and identified fatal unprovoked shark attacks on humans. 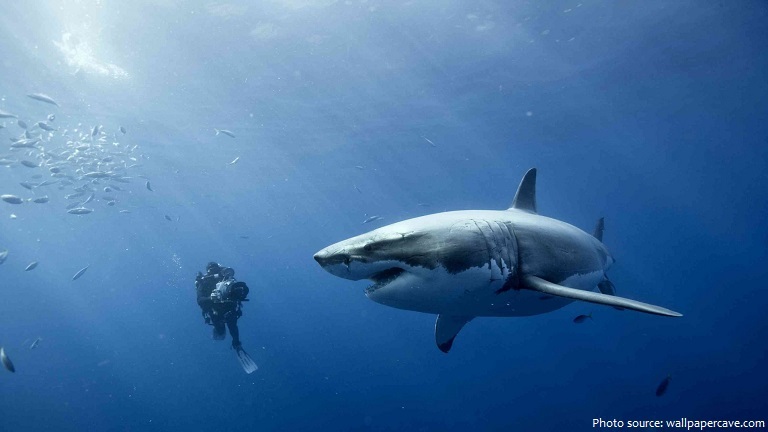 Contrary to popular belief, great white sharks do not mistake humans for seals. Great white sharks infrequently bite and sometimes even sink boats. Only five of the 108 authenticated unprovoked shark bite incidents reported from the Pacific Coast during the 20th century involved kayakers. In a few cases they have bitten boats up to 10 meters (33 feet) in length. One of the densest known great white shark populations lives around Dyer Island, South Africa, which makes the area a prime shark research location.